Before beginning a project, it is worth understanding the importance of clothing from both a status and climate perspective in the 16th century in order to determine the appropriate materials. The choice of materials, from fabric, to texture, to color, influences everything and impacts the overall effect of the work. Also, an understanding of materials available and the climate can help better decipher how a garment was constructed or why it might have been constructed one or multiple ways. First and foremost is to determine the message you sending with your fabric choice. Cloth and the materials were expensive and clothing was the outward expression of how wealthy the wearer was or wanted to be. A beautiful gown made out of the wrong materials would change the status of the wearer as quickly as court politics. Second, from 1400-1800 Northern Europe experienced a mini ice-age placing an importance on the need of several layers to be warm in addition to furs and wools to be in high use in order to ensure warmth. Wools for the rich included worsted and fine scarlets, and could also be combined with silk and linen creating serge, grosgrain, fustian, shallooon, and several others. Another popular fiber, especially for the wealthy was silk, which could be combined with any other fiber. Silk taffetas, satins, gauze, velvets, and blends were often dyed in bright colors as well as the standard black and white. Silk was also a great foundational fiber for cloth of gold or silver. Linen, used primarily for undergarments, was also used as linings and interfacing, or as blends with other fibers, since it wasn’t as warm as other options. Linen also stretches and sags in humid weather. Since Northern Europe was in a mini ice-age, it may not seem to be a prevalent issue, however the wearer’s body heat alone is sufficient to cause some stretch and sag. In a world where highly fitted and well formed garments form the basis of fashionable society, it can be clearly seen why linen was not a forerunner for the outer garments and not a great substitution for silks or wools in modern recreations. Another aspect is fabric width. Most modern fabrics come in 45”-60” wide. In the 16th century the standard was 36” wide, with some fabrics in 45”. While the chart below helps to put fabric consumption in perspective, it should also be noted that the 16th century woman was on average 5’2” and generally much smaller around then modern woman. Below is a chart for usage for English clothing. In the case of the German, looking at the fabric used in the Mary of Hapsburg dress may also help with perspective. Colors also played a pivotal role, as some dyes were more expense than others due to difficulty in achieving the color or the expense of the root/bark/insect/material that created the dye. In today’s modern world, we have the ability to create a complete spectrum of colors on a whim, so it is easy to forget that such variety was not available to the Tudor world or become seduced by the chemically created color that they could have only dreamed about. The image below shows a range of dyes on 100% lamb’s-wool threads, which were available during the 16th century using natural dyes and mordants (used to allow the dye to adhere to the fiber) available in the 16th century. The predominate dyes of the period were madder, weld, woad, indigo, cochineal, fustic, brazilwood, and cutch, which could then be over-dyed with another dye to create a variety of colors. Mordants also played an important role in the availability of colors. Roche or papal alum was a principle mordant until the reign of Henry VII when political turbulence disrupted the alum supply. Iron sulphate, aka “Green Copperas” or “Green Vitriol” in period, was also used with high popularity and served not only as a mordant but also to “sadden” or deepen a color. Of the dye colors, cochineal, which produces the royal purple (which is more magenta than purple) was (and still is) expensive and reserved for the rich. 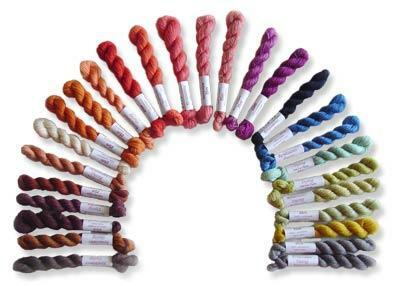 Different fibers will dye to different colors, further expanding the color range shown below. It is also important to note this is not the extent of the colors available, just the most commonly used. Also worth a quick note are notions. While ties and lacing are abundant and familiar for quite a while by this time, hooks and eyes are also being used on garments. Mellin, Laura. "Elizabethan Fabrics – A short Overview." 31 October 2006. Extreme Costuming. 10 February 2012. < http://www.extremecostuming.com/articles/elizabethanfabricsoverv.html>. Arnold, Janet. Queen Elizabeth’s Wardrobe Unlock’d. Quite Specific Media Group Ltd., 2001. Book. Covey, Liz. "Yardages for Elizabethan Garments." n.d. Elizabethan Costuming. Web. 6 February 2011. <http://www.elizabethancostume.net/yardages.html>. "Dying in the 16th Century." n.d. Renaissance Dyeing. Web. 13 March 2012. <http://www.renaissancedyeing.com/en/products/elizabethan-range/>. Images of such can be seen in several extant garments, in particular Arnold, Janet. Patterns of Fashion 4. Costume and Fashion Press, 2008. Book.